Forza Motorsport 4 (FM4) XBox 360 Review In the end, Forza Motorsport 4 is a worthy addition to the franchise and even though it is a little light on new tracks, the tracks included can be played a variety of different ways that does increase the amount of different types of ways of finishing it. There are two definitive car simulations available and both on two totally different consoles. The first game was Gran Turismo (PS2, PS3) which raised the bar for realistic car simulators and the second was Forza Motorsport (XBox, XBox 360). Both have their gaming zealots and both are pretty damn impressive when it comes to realism. However as a reviewer, I've always lent towards Forza Motorsport as it seemed a little more clean and less unrestrictive as the Gran Turismo series. 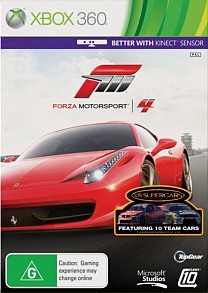 Needless to say, two great titles but this review isn't about a comparison between the franchises but rather, it's about Microsoft latest release Forza Motorsport 4! Ladies and gentlemen... get your motors running! Even though this game has been dubbed as a racing simulator, it can be played by all gamers thanks to its sliding difficulty and whether you're playing it on a XBox 360 controller or a wheel, the controls are almost flawless. The game even supports the Kinect (yay) but unfortunately it feels a little strange, especially when you pretend to hold a wheel to turn or use your head to look side to side. It's actually one of the better control systems available for the Kinect system but it does feel very awkward to use. Another slight annoyance with the game is that many of the tracks have been taken directly from Forza 3 and number four only feature 5 additional new tracks such as Hockenheim and the Indianapolis Motor Speedway which is a little bit of a cop out to gamers. But I must admit that I did enjoy the fantasy alps tracks that had this real Need for Speed atmosphere behind but with the realism of Forza. Apart from the various races and trials that you embark on, the game contains a healthy amount of vehicles at the disposal to the player and best of all, you have a decent selection at the start. 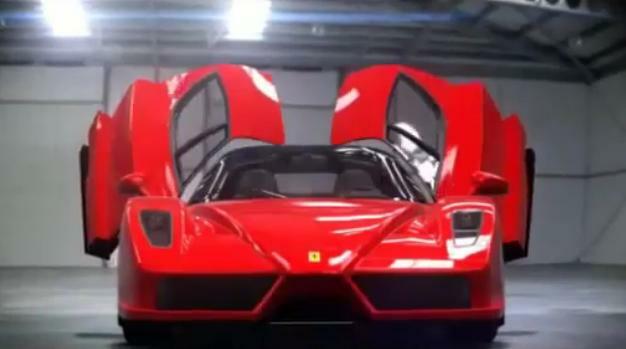 Even cooler is that Jeremy Clarkson from Top Gear fame lends his voice to the game when you check out some of the cars. You can even get involved in some Top Gear challenges as well. For eagle eyed gamers, you may have noticed the V8 Supercar logo on the packet. You get to race the cars but unfortunately not on the Australian circuits. Still... it's kind of fun. 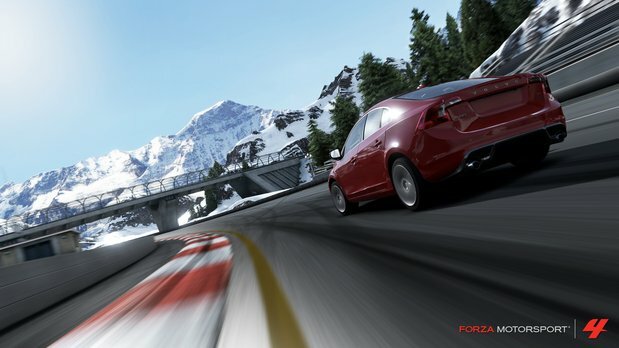 Players will probably spend most of their time (initially anyway) in the World Tour mode as they compete in various circuits and trials from around the world. This helps spice up things for the player as opposed to the sometimes repetitive nature of Forza 3 which sometimes saw you stuck behind the same car for a considerable amount of time. By driving well, you are awarded experience towards your driver which also unlocks a new car and this is the main crux behind the game. I do like the change of pace in the game from cash to experience because the better you drive, the more the game will reward you as opposed to a grinding "racing" experience. Another difference is that cars don't "level-up" with the player but rather, if you continue using a certain branded car, it's manufacturer will reward the player with various bonuses such as cash, upgrades and discounts. However cars can still be purchased with Microsoft points. In terms of controls and for realism with a wheel, the in-car view is the way to go, however with the controller, I feel that the outside view has more control due to the limitation of the controller. Even so, either method works well and there is just the right amount of force feedback as well. For newcomers, assisted braking and steering will aid in helping you learn the ropes but for those professionals already familiar with the Forza series, these need to be turned off straight away. If you do mess up, you can use the rewind feature but using aids does reduce the amount of potential earnings for your driver. As mentioned, the AI in the game works well, although at times the AI does some weird things but for the most part and depending on your level, they do give you a run for your money, however online multiplayer is definitely the way to go when you want a challenge. 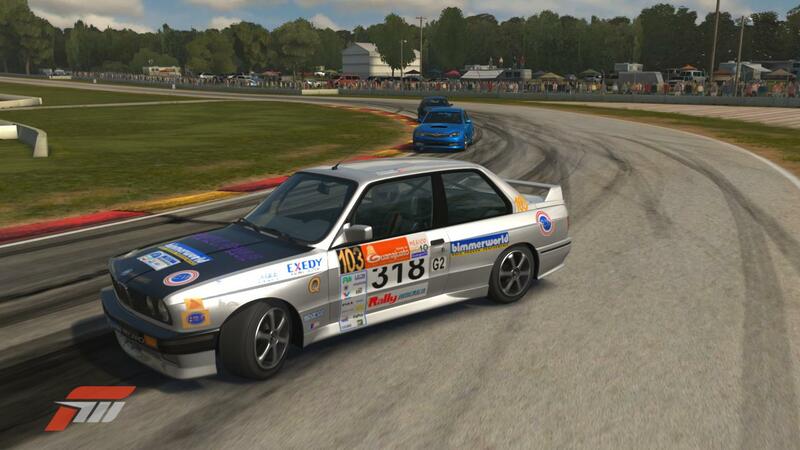 When you do connect to XBox Live, there is so much multiplayer racing to be found that it actually had us quite impressed, especially with the move from 8 players to 15. As soon as you connect to the lobby, you know that you are in for a treat and best of all, it's fast to engage with other players. Apart from the standard races, you can engage in other fun activities such as tag and my favourite drifting. One new multiplayer mode is the multi-class race which does take a little while to you get your head around. It's basically a race that allows gamers to race up to four different races on the same track but with different types of classes. This means that you not only have to watch out for your opponents but also the players from the other races which sometimes becomes a demolition derby. Graphically, the title is visually one of the best racing games available on the XBox 360 that not only contains some amazing car models but some awesome looking track detail. Best of all, there is no slowdown whatsoever in this game which really helps with the realism of the title. Even the car interiors are highly detailed and on a really large high definition TV, it's almost like being inside one of these luxury sports cars. I also love the lighting in this game that makes the cars come alive and my only gripe with this game is that I would have loved to have seen something different like night tracks. You can tweak the times of the day but there is no night racing. I would have also have loved to have seen some wild weather effects as well. The music suits the title but where the growl is, is with the realistic sound effects of the cars that sound phenomenal through surround sound. 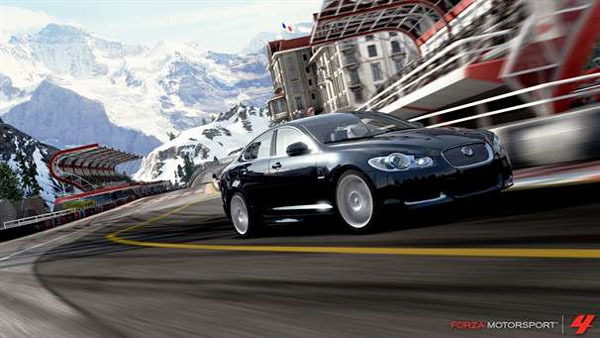 Given these facts, Forza 4 comes together perfectly with the gameplay, graphics and music. 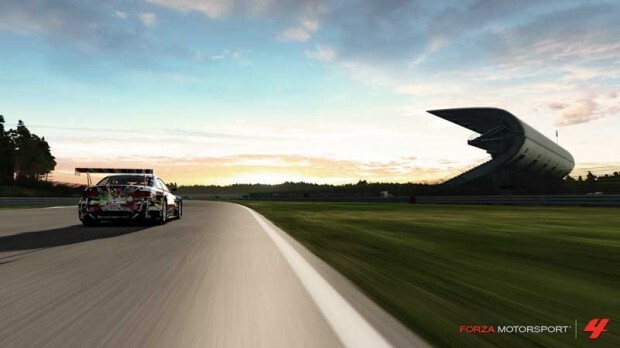 In the end, Forza 4 is a worthy addition to the franchise and even though it is a little light on new tracks, the tracks included can be played a variety of different ways that does increase the amount of different types of ways of finishing it. From tweaking your cars in the garage to racing in a variety of real-world locations, Forza Motorsport 4 is definitely for the motor buff and the developers should be commend on other awesome Forza experience that in our books was definitely far superior than Gran Turismo 5.